Follow these simple fire safety guidelines and your aging parents can continue to enjoy their winter fires safely. Consider the alternative. Senior citizens experience fire injuries and serious burns at twice the rate of other age groups. While not about seniors, part of this blog post by Leah Ingram reveals the dangers of winter fires. Our community has rallied together so quickly and enthusiastically that, in less than 48 hours, the family is no longer in need of clothing donations... That's pretty incredible. What would have been pretty incredible as well was if the family had never found themselves in this situation in the first place. It turns out that just before the fire began, someone in the house had cleaned out the fireplace and stored what were still-burning ashes in the garage. There must have been gasoline vapor in the garage, because that’s where the initial explosion occurred that caused the fire. Keep it small. Make sure your parents build the fire correctly from the start. They should stack 2 or 3 pieces of firewood or 1 firelog toward the rear of the fireplace, but in away from the back wall. Always use a supporting grate. Don't overload the fireplace. Large fires can lead to overheating of wall or roof materials, particularly if the fireplace is made of metal. Got a light? To start the fire, use a firelighter or match sticks made specifically for that purpose. Contain the fire. 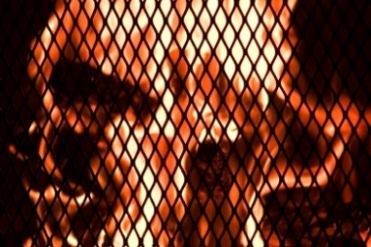 Keep the fire in the fireplace by making sure you have a screen large enough to catch any flying sparks. Decorative screens are popular, but some just won't do the job. Always use a screen around the fireplace. Use one that is dense enough to keep sparks from flying out and protect people and animals from accidental igniting of clothing or fur! Inspect around the fireplace. Check carefully for small burn holes or scorched areas that indicate that lit sparks are escaping. Keep flammable materials such as carpets, pillows, furniture or papers away from the fireplace area - at least three feet. Don't walk away. Remind your folks not to walk away and leave a fire unattended. And at night don't close the damper and go to bed before the fire has stopped burning completely and the ashes are cold. Otherwise, they are still emitting gases. Dispose of ashes properly. When cleaning the fireplace, ashes should only be stored in a special container that is non-combustible and then put some distance from the house. Don't be fooled -- make sure the ashes are completely cold before throwing them out. Check all detectors. Before any fire is built make sure the smoke detector and a carbon monoxide detector have been installed and tested. Batteries are cheap - their home was not. Protect the pets (and children). Pets (and children) don't understand the danger. The fire safety guideline is to keep them at least three feet from the fireplace -- and never leave them alone in the room. You know what they say about curiosity and cats! Watch your clothes. It would be a shame to follow all these fire safety guidelines and have a sleeve catch a spark. Clothing should be fire resistant and tight fitting around the sleeves, with no dangling belts or scarves. Keep a working fire extinquisher nearby. At holiday time, make sure the Christmas tree is not close enough to be ignited by a spark. Do not burn trash or gift wrap in the fireplace because polystyrene foam and other coated materials can generate deadly fumes. Flying paper embers could also ignite the roof.